The Amiea Sense is the result of several generations of development in the manufacture of Digital MicroPigmentation devices. This machine is cutting edge technology that demonstrates yet again that Amiea is the leader in the field of manufacturing. Recommendation: This is the most advanced device ever created, it is strongly recommended that you book a training session with Andrea (who has been using this machine for 2-3 years longer than any person in Australia) to learn how to use the device correctly. The brand new Sense Handpiece is a complete product redesign from the ground up and manufactured to compliment the brand new Top Performance TPA needle cartridges. The new cartridges cover 2/3 of the handpiece, this design reduces the need to cover that portion of the hand piece with tube sleeve hygiene barrier so you have a better grip and control over the hand piece during use. The sense handpiece is the most powerful and technologically advanced in the entire Amiea range and it comes with the widest selection of single-use needle cartridges including the new 1 Micro, Ditto (10 Slope) & Duo (5 V Slope) needles! The easily adjustable needle depth and the new innovative ultra hygienic design would be a revolution on its own but that is just the beginning, as soon as a cartridge is attached to the sense handpiece, it automatically recognises the cartridge and its profile is displayed on the touch screen display. The base station display then recommends the frequency of penetrations per second (PPS frequency) and SensiDrive® settings. For example: If a 1-micro needle cartridge (the smallest needle currently available) is attached, the sense will recommend the settings for hair like stroke of eyebrows. Click here for more information on needle cartridges for this device. This groundbreaking feature is one part of the patented “SensiDrive“ function. This is the point where Amiea demonstrates that they are the unparalleled market leaders in MicroPigmentation technology. During use the Sense Handpiece constantly sends information about the skin resistance to the ultra intelligent base station, if you have selected one of the SensiDrive modes then not only will the base station automatically adjust needle penetrations per second frequency but it will also have beneficial effect on counteracting skin recoil and maintaining the desired needle depth! In this mode the needle PPS frequency reduces when higher skin resistance from harder skin is detected. This is the perfect mode for soft shading of areola complex or lips. In this mode the sense maintains a constant needle frequency, regardless of the skin resistance. The neutral mode is intended for all regular cosmetic tattoo techniques. skin. This is especially recommended for lining techniques such as hairstrokes and lip contours; the power mode allows for precise and very accentuated lines. The Amiea Sense constantly measures skin resistance during operation. The handpiece transmits the measured resistance to the control unit alerting it to changes in skin conditions. The control unit calculates in microseconds and automatically adjusts the needle PPS frequency as desired for changes in skin resistance. The sleek, intuitive control unit with its digital controlled hand piece ensure needle precision and allows the cosmetic tattoo expert to focus fully on their work. With its two interfaces, the Amiea Sense can connect to two hand pieces, letting you switch between different colours or needle configurations. Light and compact, the Amiea Sense operates with low noise and vibration, takes up little space, and is easily transported, the touch screen control panel provides you access to groundbreaking precision control over pigment implantation. Why buy old outdated technology? If your supplier is not providing you the latest technology first why would you purchase from them? • Laser attachment - To assist healing and aid in the prevention of fever blisters (cold sore/herpes simplex). 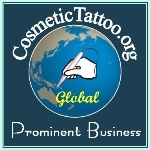 • Additional hand piece - So you easily switch to a second procedure on the same client. 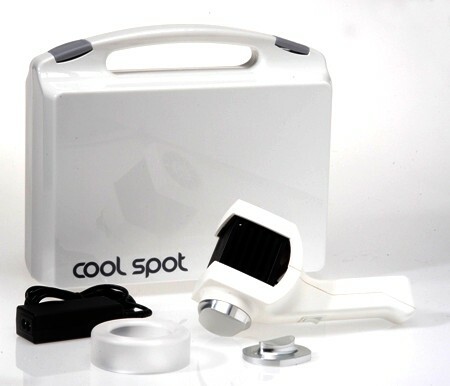 • CoolSpot Cryo Attachment - to cool your clients skin after treatments (helps reduce pain and swelling). • Software upgrades for new needle cartridge configurations involve an additional cost. NB. Due to the high value of this item postage costs at checkout must include a mail option with insurance. This is a fantastic machine at a great price so be quick because stock is strictly limited! 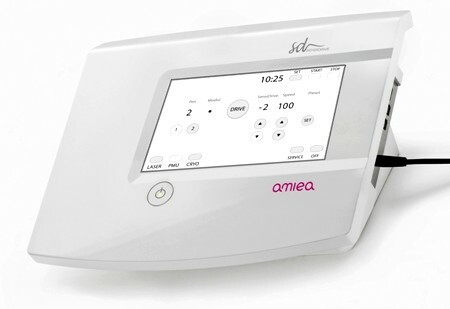 If you require training in the use of an Amiea Sense Machine please ensure that your training is provided by Andrea who has undergone training with the manufacturer, that way you ensure that you receive qualified training and an authorised CT-AIVEP - Amiea certificate upon completion, Click Here for further information. The manufacturer is a important consideration when making your purchase. You can ask for more information about this product by using the form below. 06/07/2018 Is Your Pigment Supplier Complying With the Law?